The (extremely) high resolution of the poster, version without text, is already available. Not sure if I'm aloud to share. It's all over the internet though. Can you describe how the poster looks like? Btw: Just realized that I have to wait till June 11th for the trailer because of the different time zone . Poster is now online from the distributor. The release date has now been added, it was not on the leaked photo. Jim Carrey and Jeff Daniels will also be on TODAY on Wednesday! And tonight on The Tonight Show. Great week!! Cool poster. Nice that they might get the car back (if it's not just for the poster) . Looks awesome. Very cool that they make it so close to the first one. Seems to be much love they put into the project . I'm not sure what to make of the trailer. It's great seeing Harry and Lloyd back on screen again. But the jokes seemed a little, well, over-the-top. After seeing it a few times, though, I have to admit it's growing on me more. I still believe in this movie! And I want to watch it now!!!! Ok, not all the jokes are that good in the trailer but there are many good ones and the way they act and how they made the part with the music from part 1 and stuff ... Ah, awesome . Please, discuss the trailer in the trailer-thread. Ok this just came to mind because I recently got Anchorman 2 on bluray. 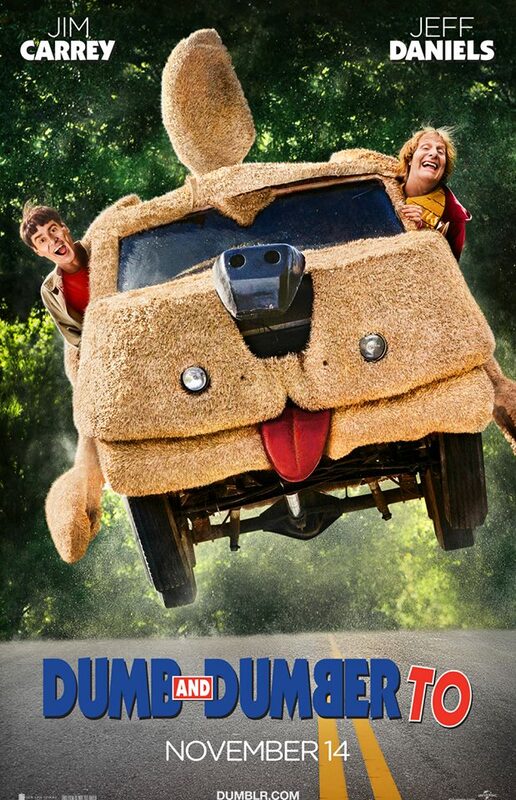 So--- Would you guys be satisfied if Dumb and Dumber To replicated the success of the Anchorman sequel? Or if it was equally funny as the Anchorman sequel? I thought it was an apt comparison given that both are sequels to great comedies coming a long time after the original. To be honest I wish my expectations were that low. But I'm certainly hoping for more. I didn't like Anchorman that much. Therefore, I probably won't watch the second part. I think it will be almost as "funny as Heaven"
I wonder how they got the phrase "funny as hell"
why not "as crude as hell"
I guess "fun as hell" is originally meant in a rather sarcastic way .